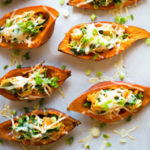 For a healthy appetizer idea, try these baked sweet potato skins that have been stuffed with seasoned chicken, cooked spinach, and greek yogurt. Easy to make and healthy for you! Back when Dustin and I used to eat ALL the things and didn’t know what terms like “clean eating” or “processed food” even meant, we ate a LOT of potato skins. Back then, our potato skins were covered in cheese and butter, topped with crispy bacon, and then happily dipped into a likely very processed ranch dressing. This was also the time I used to struggle with my weight <– you can read more on that here, if you’re interested. 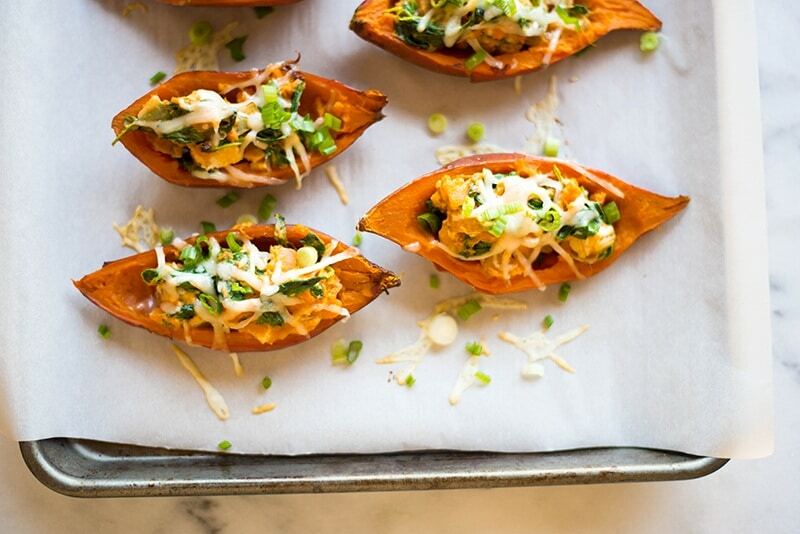 Are Sweet Potato Skins Good For You? Now, every now and again, we still enjoy a good stuffed potato appetizer on a cheat meal, but the occurrences are far less frequent and the guilt is much, much higher. It always comes at a cost, doesn’t it? There’s just something about having potato skins, though, that feels like such a treat — like the ultimate appetizer. I mean…potato skins are hearty, creamy, savory, filling, and so satisfying, it’s really no wonder why they’re such a hit. So I decided to figure out a healthy alternative to our beloved potato skins — one we could enjoy no matter if it was a cheat meal or just any regular ol’ day. One that was hearty and creamy and savory and filling, and so satisfying AND healthy. And because there’s no better way to enjoy healthy food than to have it taste as though it’s not healthy. We are weird like that. 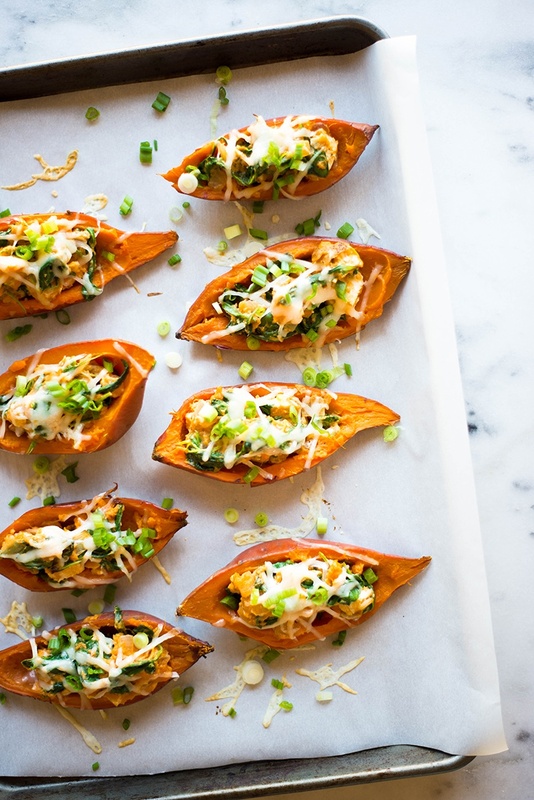 These baked sweet potato skins fulfill everything you want in a potato skin recipe and still leave you feeling like you’re sticking to your healthy eating goals. In my book: that’s a big time win. Heck, you could even dip them into this clean ranch dressing, if you’d like. Come to think of it, how come I haven’t done that yet?? BRB. Pierce the sweet potatoes using a fork all over and then lay on a sheet of aluminum foil. Drizzle with olive oil to coat evenly and then wrap tightly with the aluminum foil. Place on a rimmed baking sheet lined with aluminum foil and repeat with the remaining sweet potatoes. Bake in the oven for 45-60 minutes, or until tender. You can gently squeeze the sweet potatoes to test if they’re tender. If you’d rather speed up this process, you can also cook sweet potatoes in the microwave. To do this, just wash the sweet potatoes well and place on a microwave-safe plate. Poke several holes into the sweet potatoes all over with a fork. Then, microwave on high for 8 to 10 minutes or until tender. You can gently squeeze the sweet potatoes to test if they’re tender and, if not, cook an additional 1-2 minutes. So, yeah…they’re pretty darn healthy for you, in addition to being super tasty. 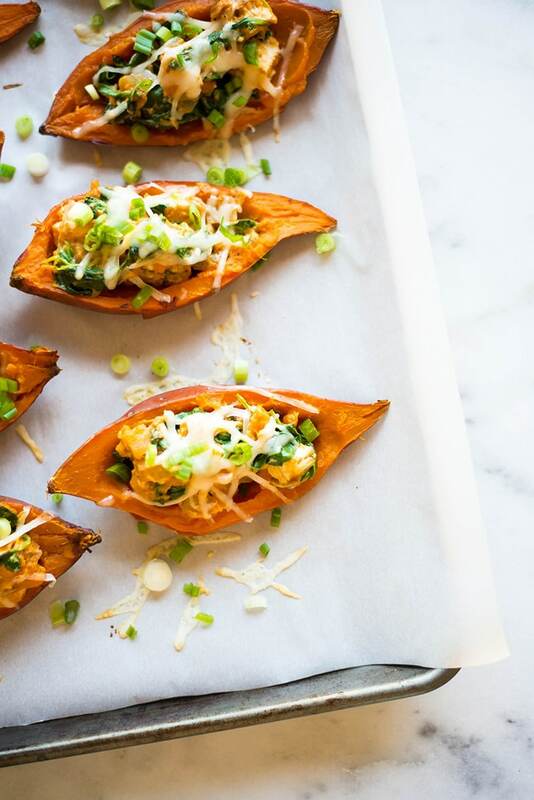 In fact, once you try these sweet potato skins, you should head over to this post for 15 more yummy and healthy sweet potato recipes. So if you’re looking for a great appetizer to share for watching the game this weekend or just want a new, lighter way to enjoy an old favorite, I sure hope you try out these healthy baked sweet potato skins. These Healthy Baked Sweet Potato Skins are super filling, savory, creamy, and a great way to change up an old favorite and make it healthy! Carefully unwrap the sweet potatoes from the foil and slice in half with a sharp knife and then let them cool for about 5-10 minutes. While the sweet potatoes are cooling, heat olive oil over medium-high heat in a skillet and add the onion. Cook until tender, then add the baby spinach and garlic and toss for 2-3 minutes, until the spinach has cooked down. Set aside. To cook the chicken, season both sides of the chicken breast with sea salt, black pepper, and garlic powder, and place into olive oil heating over medium-high heat in the same skillet. Cook, flipping occasionally, until both sides are golden and the chicken is cooked through, about 4-6 minutes per side. Remove from the pan and dice into bite-size cubes, then set aside. 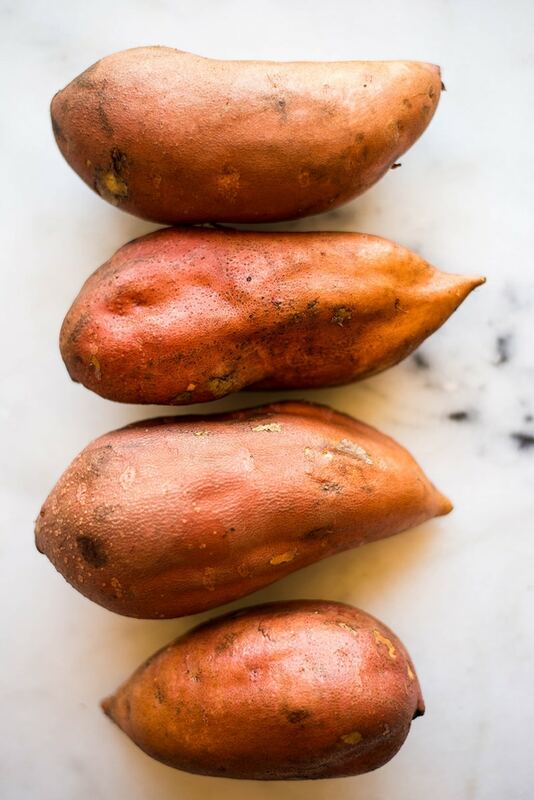 Once the sweet potatoes are cool enough to handle, carefully scrape the sweet potato out of the skin, leaving a thin layer inside with the skin so that it can still stand up on its own. 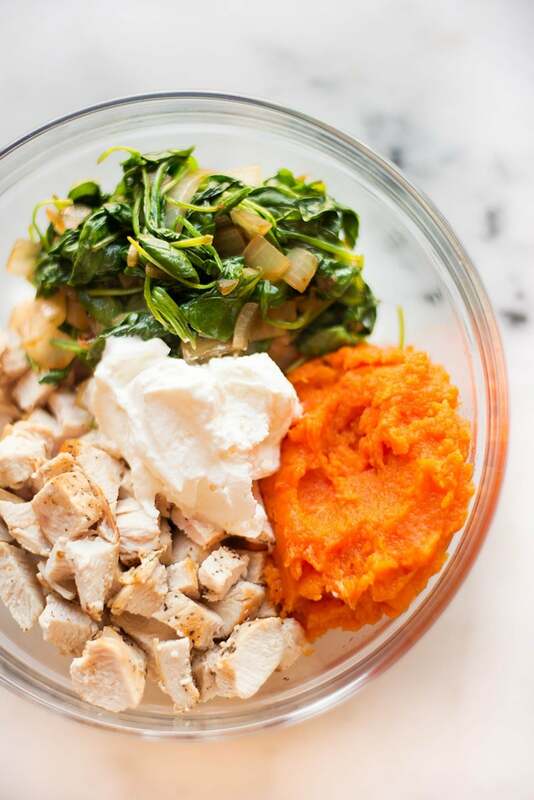 Add the sweet potato to a large mixing bowl, along with the greek yogurt, chicken, and the spinach mixture. Stir to combine and season with any additional sea salt or black pepper, as needed. Coat the potato skins with a drizzle of oil and place back into the oven for 10-15 minutes to get a nice crispy skin. 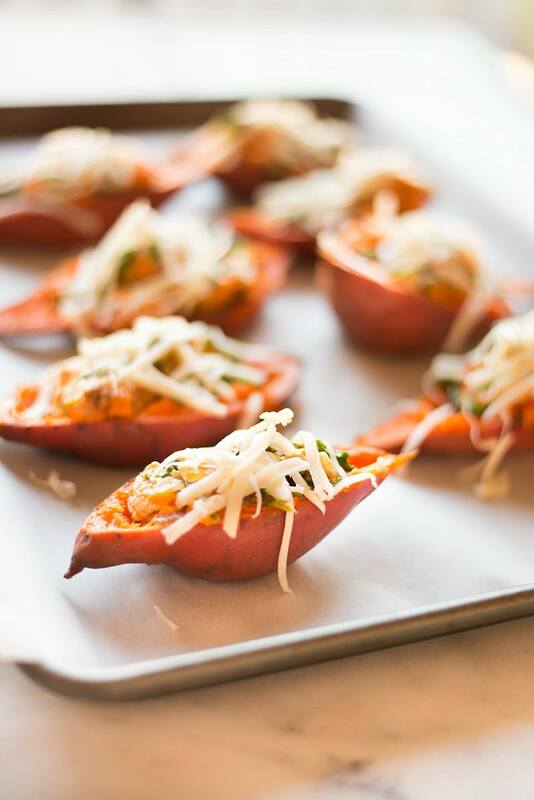 Remove from the oven and fill each skin with the sweet potato mixture, topping with shredded jack cheese. Bake again for 10-15 minutes, or until the cheese has melted and the filling has heated through. I added tofu instead of chicken and didn’t add any cheese (not vegan, I just didn’t have chicken or cheese lol). They were sooo good. I truly recommend this recipe. Thank you for posting amazing stuff like this!